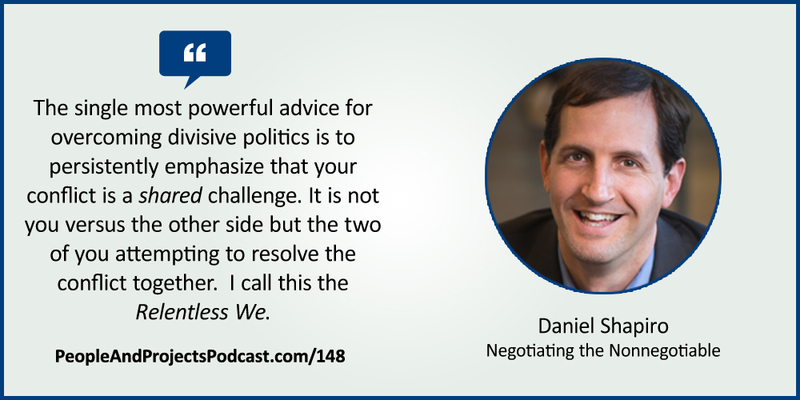 In this episode, I welcome Harvard's Daniel Shapiro to talk about his new book Negotiating the Nonnegotiable: How to Resolve Your Most Emotionally Charged Conflicts. If you lead projects and teams, conflict is inevitable and can make negotiating for resources and changes a real challenge. Dan gets past the typical teaching on conflict, focusing on the most challenging conflict and negotiation situations we face: where emotions and identity are at stake. THE INNER CONFLICT by The New Geometry is licensed under a Attribution-NonCommercial-ShareAlike License. CAN I BELONG TO THE TRIBE by Juanitos is licensed under a Attribution-ShareAlike 2.0 France License. LIFE OF RILEY by Kevin Macleod Licensed under a Creative Commons: Attribution 3.0 License.